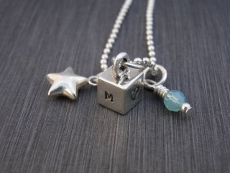 Our cute and dainty cube necklace is perfect for the person that prefers simplicity and stylish jewelry. Cubes will hold 1 initial per side with up to 4 initials per cube. The cube measures 6mm x 6 mm and has a high polished finish. The cubes are hung on sterling silver ball chains which are 16”, 18” or 20”. To order this item, please select a style, enter initial (1 per cube), then click the Add to Shopping Cart button. * Initial order is front/left/right/back.